↑ 1.00 1.01 1.02 1.03 1.04 1.05 1.06 1.07 1.08 1.09 1.10 1.11 1.12 1.13 1.14 1.15 1.16 1.17 Anglada-Escudé, G.; Amado, P. J.; Barnes, J.; Berdiñas, Z. M.; Butler, R. P.; Coleman, G. A. L.; de la Cueva, I.; Dreizler, S.; Endl, M.; Giesers, B.; Jeffers, S. V.; Jenkins, J. S.; Jones, H. R. A.; Kiraga, M.; Kürster, M.; López-González, M. J.; Marvin, C. J.; Morales, N.; Morin, J.; Nelson, R. P.; Ortiz, J. L.; Ofir, A.; Paardekooper, S.-J. ; Reiners, A.; Rodríguez, E.; Rodrίguez-López, C.; Sarmiento, L. F.; Strachan, J. P.; Tsapras, Y.; Tuomi, M.; Zechmeister, M. (25 August 2016). "A terrestrial planet candidate in a temperate orbit around Proxima Centauri" (PDF). Nature (in อังกฤษ). 536 (7617): 437–440. doi:10.1038/nature19106. ISSN 0028-0836. ↑ Torres, C. A. O.; Quast, G. R.; Da Silva, L.; De La Reza, R.; Melo, C. H. F.; Sterzik, M. (December 2006). "Search for associations containing young stars (SACY). I. Sample and searching method". Astronomy and Astrophysics. 460 (3): 695–708. arXiv:astro-ph/0609258. Bibcode:2006A&A...460..695T. doi:10.1051/0004-6361:20065602. ↑ 3.0 3.1 Ségransan, D.; Kervella, P.; Forveille, T.; Queloz, D. (2003). "First radius measurements of very low mass stars with the VLTI". Astronomy and Astrophysics. 397 (3): L5–L8. arXiv:astro-ph/0211647. Bibcode:2003A&A...397L...5S. doi:10.1051/0004-6361:20021714. ↑ Demory, B.-O. ; Ségransan, D.; Forveille, T.; Queloz, D.; Beuzit, J.-L.; Delfosse, X.; Di Folco, E.; Kervella, P.; Le Bouquin, J.-B. (October 2009). "Mass-radius relation of low and very low-mass stars revisited with the VLTI". Astronomy and Astrophysics. 505 (1): 205–215. arXiv:0906.0602. Bibcode:2009A&A...505..205D. doi:10.1051/0004-6361/200911976. ↑ 5.0 5.1 5.2 Schlaufman, K. C.; Laughlin, G. (September 2010). "A physically-motivated photometric calibration of M dwarf metallicity". Astronomy and Astrophysics. 519: A105. arXiv:1006.2850. Bibcode:2010A&A...519A.105S. doi:10.1051/0004-6361/201015016. ↑ 6.0 6.1 A Potentially Habitable World in Our Nearest Star. Planetary Habitability Laboratory. 24 August 2016. ↑ "Earth-like planet discovered orbiting sun's neighbor". CNN. 24 August 2016. สืบค้นเมื่อ 24 August 2016. A planet named Proxima b has been discovered orbiting the closest star to our sun. ↑ Davis, Nicola (24 August 2016). "Discovery of potentially Earth-like planet Proxima b raises hopes for life". The Guardian. สืบค้นเมื่อ 24 August 2016. ↑ 9.0 9.1 9.2 Chang, Kenneth (24 August 2016). "One Star Over, a Planet That Might Be Another Earth". New York Times. สืบค้นเมื่อ 24 August 2016. ↑ 10.0 10.1 10.2 Strickland, Ashley (24 August 2016). "Closest potentially habitable planet to our solar system found". CNN Health. สืบค้นเมื่อ 25 August 2016. ↑ "Planet Found in Habitable Zone Around Nearest Star". European Southern Observatory. 24 August 2016. ↑ ""Found! Potentially Earth-Like Planet at Proxima Centauri Is Closest Ever "". Space.com. 24 August 2016. ↑ Knapton, Sarah (24 August 2016). "Proxima b: Alien life could exist on 'second Earth' found orbiting our nearest star in Alpha Centauri system". The Telegraph. Telegraph Media Group. สืบค้นเมื่อ 24 August 2016. ↑ 14.0 14.1 14.2 "Proxima b is our neighbor… better get used to it!". Pale Red Dot. 24 August 2016. สืบค้นเมื่อ 24 August 2016. ↑ "Follow a Live Planet Hunt!". European Southern Observatory. 15 January 2016. สืบค้นเมื่อ 24 August 2016. ↑ 17.0 17.1 Mathewson, Samantha (24 August 2016). "Proxima b By the Numbers: Possibly Earth-Like World at the Next Star Over". Space.com. สืบค้นเมื่อ 25 August 2016. ↑ 18.0 18.1 Witze, Alexandra (24 August 2016). "Earth-sized planet around nearby star is astronomy dream come true". Nature. pp. 381–382. doi:10.1038/nature.2016.20445. สืบค้นเมื่อ 24 August 2016. ↑ Marchis, Franck (24 August 2016). "Proxima Centauri b: Have we just found Earth's cousin right on our doorstep?". The Planetary Society. สืบค้นเมื่อ 24 August 2016. ↑ Ségransan, D.; Kervella, P.; Forveille, T.; Queloz, D. (2003). "First radius measurements of very low mass stars with the VLTI". Astronomy and Astrophysics. 397 (3): L5–L8. arXiv:astro-ph/0211647. Bibcode:2003A&A...397L...5S. doi:10.1051/0004-6361:20021714. ↑ Fraser Cain (15 September 2008). "Temperature of the Sun". Universe Today. สืบค้นเมื่อ 19 February 2011. ↑ Fraser Cain (16 September 2008). "How Old is the Sun?". Universe Today. สืบค้นเมื่อ 19 February 2011. ↑ Jao, Wei-Chun; Henry, Todd J.; Subasavage, John P.; Winters, Jennifer G.; Gies, Douglas R.; Riedel, Adric R.; Ianna, Philip A. (2014). "The Solar Neighborhood. XXXI. Discovery of an Unusual Red+White Dwarf Binary at ~25 pc via Astrometry and UV Imaging". The Astronomical Journal. 147 (1): 21. arXiv:1310.4746. Bibcode:2014AJ....147...21J. doi:10.1088/0004-6256/147/1/21. ISSN 0004-6256. ↑ 25.0 25.1 Clery, Daniel (26 August 2016). "The exoplanet next door". Science News. สืบค้นเมื่อ 28 August 2016. 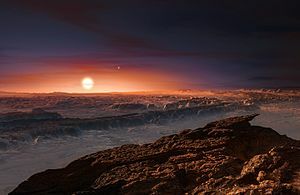 Researchers have already found hundreds of similarly sized planets, and many appear to be far better candidates for hosting life than the one around Proxima Centauri, called Proxima b. ↑ Amos, Jonathan (24 August 2016). "Neighbouring star Proxima Centauri has Earth-sized planet". BBC News. สืบค้นเมื่อ 25 August 2016. Just how "habitable" this particular planet really is, one has to say is pure speculation for the time being. ↑ 28.0 28.1 28.2 The habitability of Proxima Centauri b - II. Possible climates and observability. Retrieved 25 August 2016. ↑ 29.0 29.1 29.2 Singal, Ashok K. (2014). "Life on a tidally-locked planet". Planex Newsletter. 4 (2): arXiv:1405.1025. arXiv:1405.1025. Bibcode:2014arXiv1405.1025S. ↑ Barnes, Rory, ed. (2010), Formation and Evolution of Exoplanets, John Wiley & Sons, p. 248, ISBN 3527408967. ↑ Heller, R.; Leconte, J.; Barnes, R. (April 2011). "Tidal obliquity evolution of potentially habitable planets". Astronomy & Astrophysics. 528: 16. arXiv:1101.2156. Bibcode:2011A&A...528A..27H. doi:10.1051/0004-6361/201015809. A27. ↑ 32.0 32.1 "Numerical simulation of possible surface temperatures on Proxima b (synchronous rotation)". ESO. 2016. สืบค้นเมื่อ 24 August 2016. ↑ Makarov, Valeri V. (June 2012), "Conditions of Passage and Entrapment of Terrestrial Planets in Spin-orbit Resonances", The Astrophysical Journal, 752 (1): 8, arXiv:1110.2658, Bibcode:2012ApJ...752...73M, doi:10.1088/0004-637X/752/1/73, 73. หน้านี้แก้ไขล่าสุดเมื่อวันที่ 21 กุมภาพันธ์ 2562 เวลา 03:41 น.